Fly Lady: Are you losing your mind? Front Page » Sports » Fly Lady: Are you losing your mind? It is sensory overload and our database has failed to file the information in the proper place. Can you tell that I am learning to speak geek? Let’s think about this overload for a second. When I am sitting at home in my chair with my computer on my lap, four dogs, a television on with a ticker tape scrolling across the bottom or music playing, a house phone, a cell phone, my assistant Michele, my ipod, text messaging and instant messaging, emails coming in, the doorbell ringing and my sweet darling somewhere in the house. It is a miracle that I can do anything much less remember something that is tossed into this chaotic mix. We are so smug at believing that the ability to multitask is a virtue. All it really does is divide our attention, take us longer to accomplish anything and make us feel frazzled. Only thing that it does is make us look busy. Just because we look as if we are doing something doesn’t mean we are accomplishing anything. This is called busy work. It’s no wonder why we can’t remember anything. We are not losing our minds! We are multitasking! I started my day at 7:30am by 8:00am I was ready to start writing and by 11:00am I was finished with ten pages or I had worked for three hours. In two weeks I had a manuscript. Do you see what you can accomplish when you turn off the distractions and tune into your brain power! Are you ready to FLY! 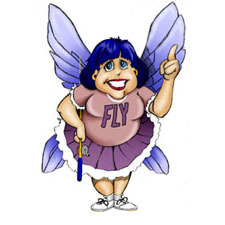 For more help getting rid of your clutter and CHAOS, check out her website and join her free mentoring group at www.FlyLady.net or read her book, Sink Reflections published by Random House. Help me build a Habitat Home this year.http://www.share.habitat.org/flyladybuildproject Please bless others with your clutter by donating it to a Habitat for Humanity Restore near you. Copyright 2013 Marla Cilley Used by permission in this publication.